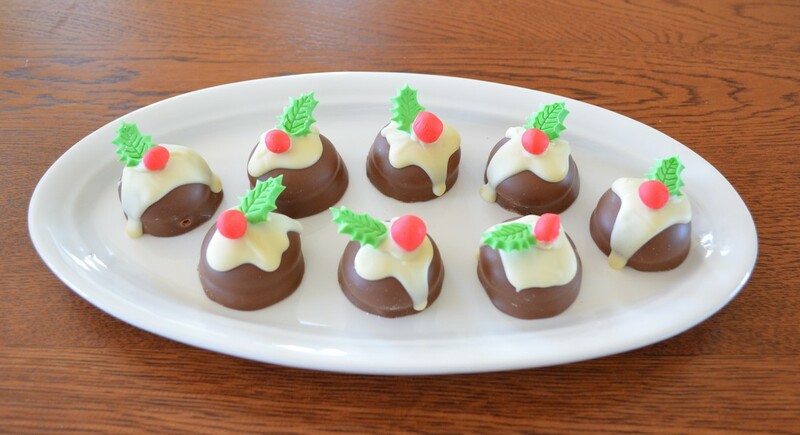 This one is for those of you that want a simple sweet treat to serve at Christmas. Or it could be a simple treat you might want to do with your kids. This is so easy and they look so cute and only take minutes to make. Now pictured I moulded the holly out of fondant. You just buy fondant from the super market, tint it a little and shape it, I do have a fondant leaf cutter, so if you have it, you can make it. But the recipe actually just uses Jaffas and spearmint leave lollies, even easier. Quick, easy and looks great on the Christmas table. Place the white chocolate melts into a heatproof bowl. Place bowl over a pan of simmering water, making sure the water does not touch the bowl. Stir regularly until all the chocolate has melted. Allow to cool for 5 minutes. Spoon the melted chocolate into a sealable plastic bag and make a small snip in one corner of the bag to make it a piping bag. Pipe enough white chocolate on top of the biscuits, allow to drip down the side to resemble custard flowing over the pudding. Place a jaffa on top and a small spearmint leaf on one biscuit, hold in place until the chocolate sets enough to keep it in place, then repeat with the remainder of the biscuits.